There is no one who denies the beauty of the natural landscape of the Bromo area from the peak view point sunrise Penanjakan. Many travelers take pictures of this scene at sunrise, especially during the holiday season, the situation will become more crowded. 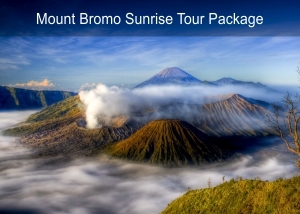 This Mount Bromo sunrise tour package is preferred by travelers because you are picked up using a jeep while doing tours in Bromo. After finishing the sunrise from Penanjakan, along with other participants in the jeep go down to the parking area below Mount Batok. Walk in the desert and climb the stairs to the crater of Mount Bromo. From the top of the crater you can see the core of the crater that is still active and emits thin smoke. Like the information you have heard, Mount Bromo is a mountain that has been active until now. This tour package can be done for you who are already in the city of Yogyakarta. A minibus will pick you up at the hotel in the morning. In the morning after breakfast around 7.30 you will be picked up in the hotel by minibus. Minibus with a passenger capacity of 9-13 people equipped with AC. In the minibus you will join other participants with the same destination, Mount Bromo. The trip is expected to take 12 hours without traffic jams. Minibus will stop at the toilet and also at the restaurant during lunch. After arriving in Probolinggo you will stop for a moment in the representative office for a small briefing and wait for the group of participants who have not yet arrived. Then proceed to the hotel in the Bromo area for a break and stay one night. In the early morning at 3.15 you will be picked up by Jeep to the Penanjakan view point with other participants. Drive a jeep for about 45 minutes to get to the View Point parking area, and you will climb a little to reach the top of Penanjakan. After seeing the amazing sunrise scenery, the next destination is Mount Bromo. From the Mount Bromo parking area you have to walk and climb the stairs to reach the top of the crater. After exploring the crater and Mount Bromo you will be transported back to the hotel by Jeep at 08.00. At 9:30 a minibus will be picked up at the representative office in Probolinggo. This tour package includes public bus transportation to the Mengwi bus terminal in Bali and other cities.